On a angry angry desolate Lake Michigan beach in mid-October, my dog Toby and I are getting our morning exercise running down the beach and desperately trying to stay out of the frigid water (about 50 degrees this time of year). A storm came in late yesterday and the wind howled all evening long. 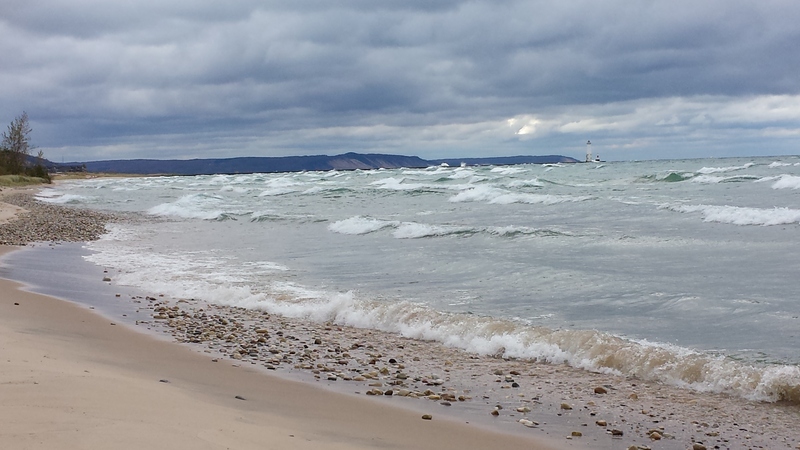 If you have ever talked to someone that lives along the big Lake, they’ll commonly use the term “it sounded like a freight train” to describe the wind through the trees along the bluffs and dunes of the western Michigan coastline. The water carries huge rocks and boulders up the beach and the surge pushes waves more than 20-25 feet up the beach. Its nothing short of spectacular to watch and marvel at. Its powerful. So the air temp is 47 degrees and the wind is blowing about 25-30 mph into my face, so I put my head down and run trying to keep an eye on Toby. She’s been known to run into the beach grass and woods and come back with all kinds of fun stuff, ie. pieces of fish, birds, rabbits, and even crazier, once a piece of recently deceased fox and deer. A dog off a leash on a beach goes from a mild mannered domestic best friend to a crazy eyed 45lb carnivore with severely compromised discerning taste. I look up to catch a glimpse of where Toby is and I see it. I don’t immediately stop because it’s something that we have seen thousands of times. But as I get about 10 feet past it, it clicks. 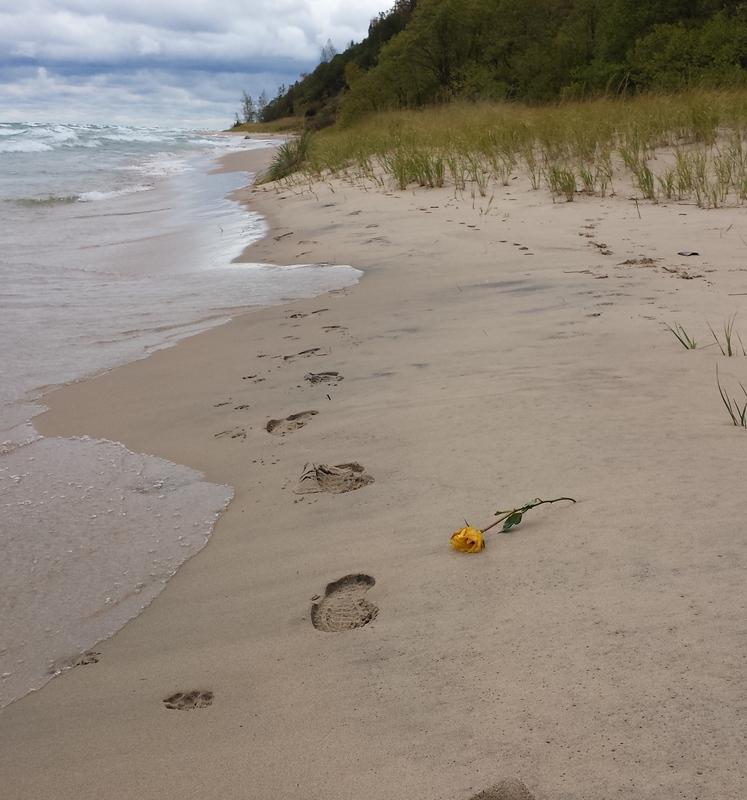 How the heck does a single yellow rose get on a beach, a mile away from the nearest town, on a lake where pleasure boating stopped more than a month ago? What could the story be behind this? There are certainly no other footprints on this beach. Hell, you have to be a little looney or have some crazy sense of romantic adventure to even be out here. So if it didn’t come from a person on the beach, it must have come from the water. The other side of the lake is 60 miles away. The only boats/ships out on the water this time of year are barges carrying iron ore, oil, and gosh knows what other commodities to/from the Atlantic and the Great Lakes. These are not ships of which love stories are taking place with couples nuzzling along the deck. These are ships that are much more likely to have a “Captain Phillips” moment taking place with men that haven’t seen a church, a hot shower or a woman in days, weeks, or months. So as I run another mile or so down the beach and back, I’m thinking that it’s these crazy little things that make our lives interesting. It spurs our curiosity and imagination. Who was the giver, or the recipient who carelessly (or carefully) tossed this single yellow rose? What ever the case and the story behind the rose, there is probably nothing more fitting than this discarded symbol of love and friendship finding itself on the angriest of mornings on this turbulent, lonely, and frigid beach.